In this paper, the impact of temperature on the electromagnetic susceptibility of operational ampli¯ers at di®erent frequencies is presented. The IEC 62132-4 direct power injection standard has been used with several commercials operational ampli¯ers in a printed circuit board speci¯cally fabricated. The results show that the susceptibility of the operationals ampli¯er is reduced with the temperature. Fernandez, R.; Gil, I. 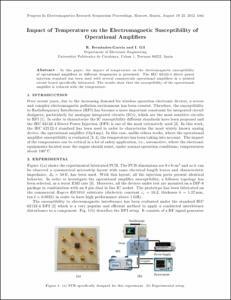 Impact of temperature on the electromagnetic susceptibility of operational amplifiers. A: Progress in Electromagnetics Research Symposium. "Proceedings PIERS 2012 Moscow". 2012, p. 1063-1065.